BA/Educ-Econ; ICPAU, ACCA, FCCA, MBA) holds a Master’s degree in Business Administration from Herriot-Watt University-UK. She is a Fellow of the Association of Chartered Certified Accountants–United Kingdom. She received an Award of the Best National ACCA Candidate in Strategic Business Planning and Development in December 2002. She has around 20 years of banking experience of which 50% has been at senior management level. Edigold was the first Ugandan female managing director of a commercial bank and she recently became the first female managing director of a commercial bank in Rwanda too. She was decorated with a Golden Jubilee Medal by the President of the Republic of Uganda in 2015 for her contribution to the development of the nation. 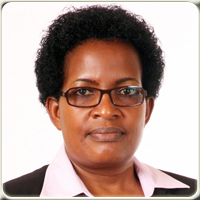 She was twice elected as a Vice Chairman of Uganda Bankers Association (UBA) and currently the 1st Vice Chairman for Rwanda Bankers Association.